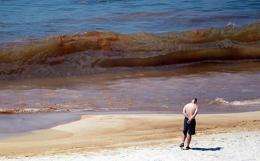 A beachgoer looks at oil in the water on Orange Beach, Alabama, in June 2010. The X Prize Foundation launches a competition this week promising millions of dollars for winning ways to clean up crude oil from the BP spill in the Gulf of Mexico. The X Prize Foundation launches a competition this week promising millions of dollars for winning ways to clean up crude oil from the BP spill in the Gulf of Mexico. The nonprofit group will hold a press conference in Washington on Thursday to reveal details of an Oil Cleanup X Challenge inspired by the disaster. It added that the competition is "designed to inspire entrepreneurs, engineers, and scientists worldwide to develop innovative, rapidly deployable, and highly efficient methods of capturing crude oil from the ocean surface." X Prize categories include mapping genomes, making an incredibly fuel efficient car, and exploring the moon's surface with a robotic vehicle. For three months, a massive slick threatened the shorelines of Louisiana and other southern US Gulf Coast states as BP tried everything from top hats to junk shots and giant domes to stanch the toxic sludge. A cap stopped the flow on July 15 after between 2.8 and 4.5 million barrels (117.6 million and 189 million gallons) had gushed out. Only one quarter of that was collected by BP's various collection and containment systems. Dozens of reconnaissance planes fly constant sorties from Florida to Texas noting any oil sightings, while flat-bottomed boats trawl the marshes for lumps of tar too large to biodegrade. Before the cap went on, some 25,000 barrels of oil a day were being skimmed from the thickest part of the slick near the well site.